Volvo Cars’ XC90 has been awarded the highest possible safety rating from the Insurance Institute for Highway Safety (IIHS), underscoring its position as one of the safest cars on the road today. The seven seat SUV was awarded a Top Safety Pick+ rating, which is only given to cars that achieve full scores in all crashworthiness and front crash prevention tests and which excel in both preventive and protective safety performance. The IIHS award follows a decision last week by Euro NCAP, the European safety regulator, to award the XC90 five stars in its 2015 Euro NCAP tests. The XC90 was the first car from any manufacturer to score full points in the Autonomous Emergency Braking Car to Car rear-end tests (AEB City & AEB Interurban). This means that the XC90 has now received the best possible ratings for safety from the most respected independent assessors of car safety in both Europe and the US. The IIHS crashworthiness category includes tests covering small overlap, moderate overlap, side, roof strength, head restraints and seats. Volvo achieved top scores in all of these tests and was deemed superior in front crash prevention thanks to the standard City Safety technology that is fitted in the new XC90. The XC90 is built on Volvo’s new Scalable Product Architecture (SPA) platform, which prioritizes safety and electrification. 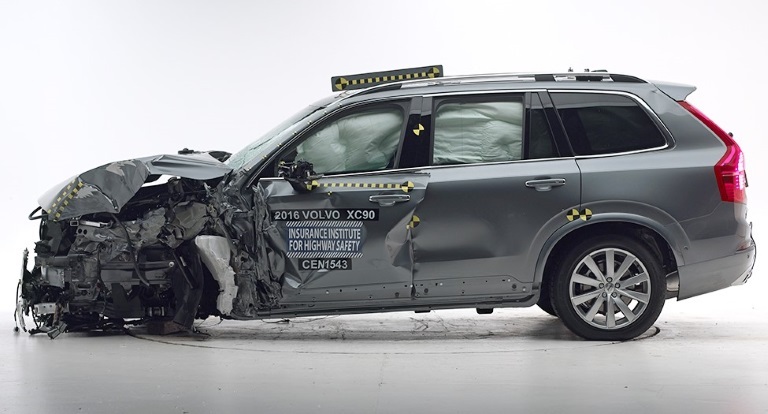 The XC90’s performance in the small overlap crash test, one of the most demanding crash tests available, highlighted a new design that deflects the car after impact. This design significantly reduces the potential for driver and passenger injury. Other safety design elements, such as a breakaway brake pedal and deformation zones in the front seat brackets, help prevent serious injuries in a variety of crash scenarios. All of these safety innovations are a result of Volvo’s unprecedented 40 year effort of recording and studying real-world accidents. The 2016 XC90 has exceeded sales forecasts around the globe, with 57,000 cars sold compared to a forecast 50,000. Demand for Volvo SUVs has been very strong in the United States and the Volvo XC60 has seen a resurgence in sales and interest. The XC60 is also a Top Safety Pick+. ← Turned your computer off?